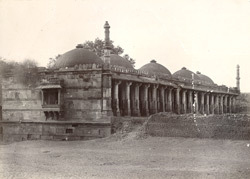 Photograph, from the south-east, of the ruined Fath Masjid at Ahmadabad in Gujarat, taken by Henry Cousens in c. 1890, from Archaeological Survey of India Collections. The Fath Masjid was built in the late 15th century, probably by Darya Khan. It has five domes; the area covered by the central dome is separated from the other domes by a double aisle on each side. The pillars have shafts that are square on the bottom half and octagonal on the top, with a square base. Most of the pillars are unadorned except for about eight with carvings, which have been taken from a Hindu or Jain temple. This view shows the open facade with two slender minarets at each corner.